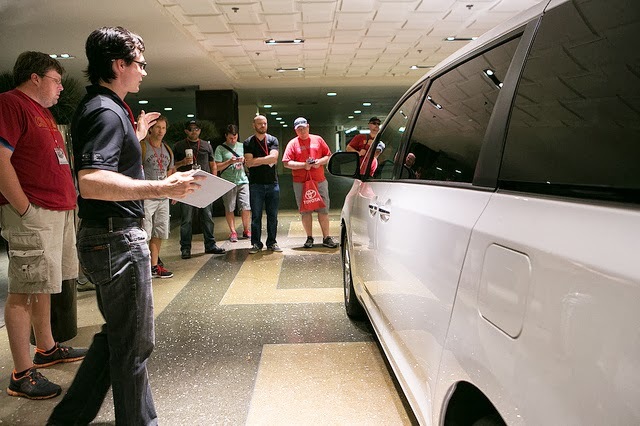 Last month I was invited to come to Las Vegas with a group of other bloggers and writers, all male, mostly dads, to experience driving the new models of the Toyota minivan, the Sienna. Now, here's the thing: Some men see driving a minivan as a compromise they have to make when they become parents. They don't think they're driving a "man's car" anymore, but a "parent's car." Personally, I do what I need to do and I drive what I need to drive. Letting the popular perception of a car determine the level of your masculinity doesn't make you more of a man, you know? We bought our first Toyota in 2003. It was a 2004 Prius, back when you had to wait for weeks/months (depending on how well you knew the dealer) for one of those. We loved our Prius, which made us love Toyota, so when it was time to get a second car, we got another Toyota--this time a Camry Hybrid. We leased that one, and when the lease was done, we leased another Prius. Now we had two Priuses. Last year, when the 2004 Prius was getting old, we leased yet another Toyota: the Prius V--the station wagon version of the Prius. And then, a few months ago, when we were trying to buy a house, our lender told us we would get the loan if we ended one of our leases. The 2010 Prius lease was almost done, so we returned it and became a one-car family. Our loan was approved, we bought the house, and now we need to decide whether we stay a one-car family or buy a new car. We've been with Toyota for the last 10 years, so it is likely that if/when we buy or lease a new car, it will be another Toyota. The last car I drove before we got the Camry was a pickup truck, which I hated, because no matter how many sandbags I packed in the back, the truck would always slide on frozen roads. Then I got the Camry and now the Prius V, and I'm happy. 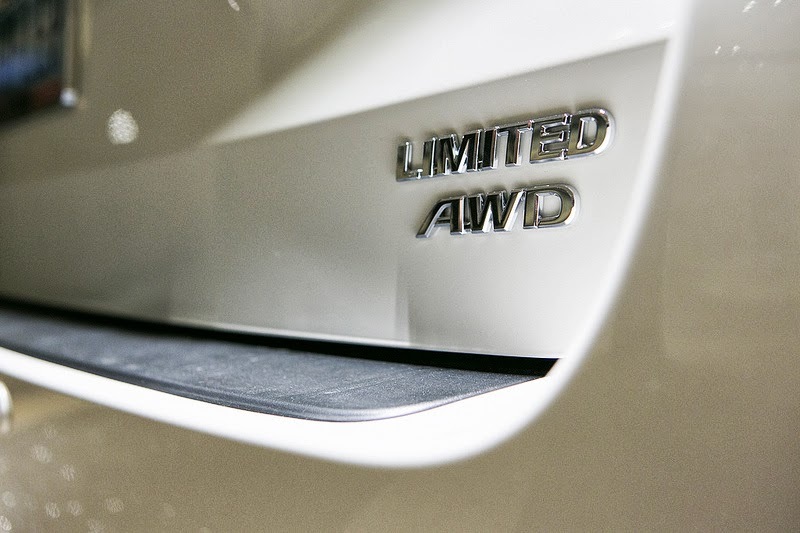 The only compromise I can think of with hybrids--they don't accelerate as quickly as non-hybrid cars--has nothing to do with masculinity or with self-identity. Every car has pros and cons, and if we end up buying a minivan, we will give up the gas-mileage we could get with the Prius, and get instead tons of space, folding seats (7 or 8 seats, depending on the model), remote controlled doors, better acceleration, and a bunch of other optional things (sunroof, dual freakin' video screen, heated side mirrors, and more). If we decide to get a second car, the decision will have everything to do with the pros and cons of the specific car, and absolutely nothing to do with the perception of the car according to the self-described arbiters of popular culture. There's no such thing as a "real man's car," because "real men" only exist in the minds of people who have something to gain from reinforcing silly stereotypes. And that's that. We're kind of in the market for a new car, and we've been with Toyota for 10 years. 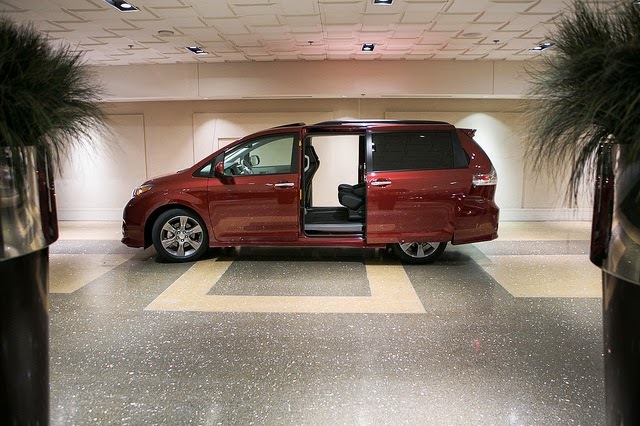 And driving the Sienna for these 3 days in Vegas made me think that maybe--and here's that "compromise" word again-- we've compromised for too long: maybe we deserve to stretch our legs. Maybe our kids deserve a freakin' foot rest and their own cup holders. Maybe when it's time to move, we can do a lot of the moving in our minivan with seats that can be folded and pushed in. But I know that for some parents, a minivan is a parenting-related compromise. When you become a parent, you drink less, you sleep less, you play less video games, and you buy a car that fits your new lifestyle. 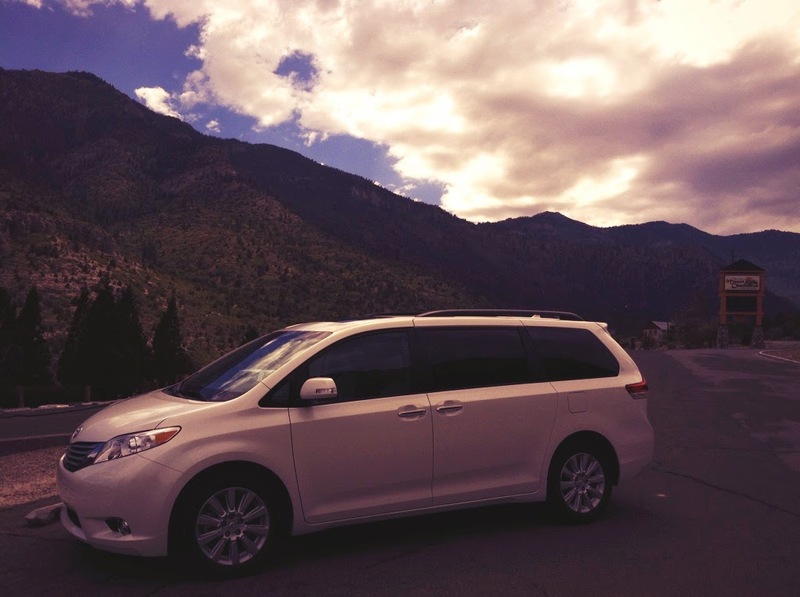 And if you're a dad who's worried that the car that fits your new lifestyle may not be the car that fits the self-identity you're trying to portray, then Toyota wants you to know the Sienna might be the car for you after all, which is why, as a blogging dad, I ended up on a 3-day Vegas adventure. 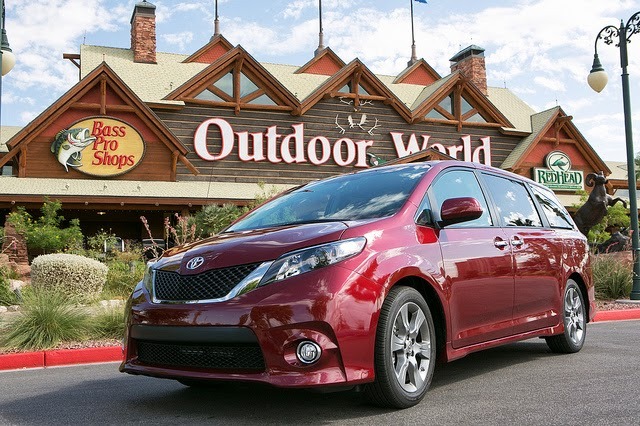 We officially started with a walkaround, introducing us to the latest Sienna models, which included a more sporty, aerodynamic model as well as a limited model with 19" tires and all-wheel-drive. Some of the cars had 8 seats, and others had dual video screens. Siennas had power sliding doors, windows (even on the third row), and moonroofs. They had power outlets. They had blind spot monitors. They had three-zone climate control... The more I write about it... It's nice to have triple-zone climate control, is what I'm saying. But like I said, the issue here is not that the cars have or don't have everything we need. The issue here is perception, and changing the minds of those who think the fun of driving ends in the delivery room. 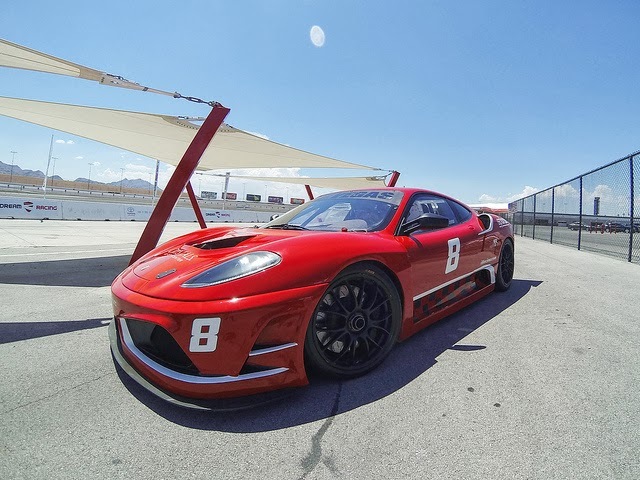 Which is how we ended up racing the Siennas at the Las Vegas Motor Speedway. Before that, we spent the day at the Bass Pro shop, where we had a friendly Outdoorsman Challenge competition. We kayaked in a pool outside the store, practiced casting fishing (? ), archery, shooting a (pallet) rifle and a handgun, and having lunch surrounded by stuffed animals, including tiny deer heads. By this point, I was already miles beyond the borderline of my comfort zone, but hey, an adventure is an adventure, and every once in a while, I can allow myself to live someone else's idea of masculinity. This is me, with a pretty good spread. 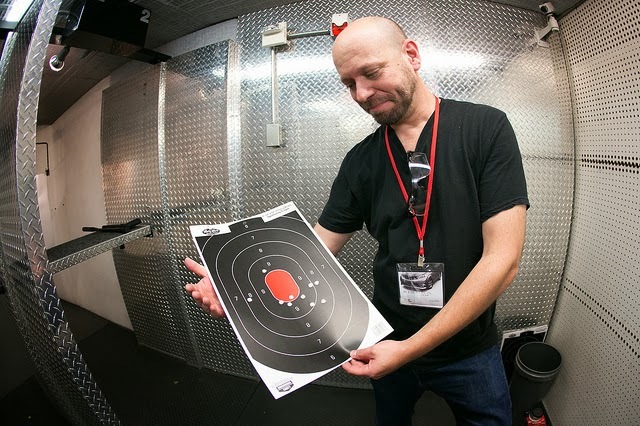 I wasn't trying to kill the target--just scare it. After lunch, we divided into groups for a scavenger hunt, where each group had to drive a Sienna to a number of spots, including the amazing Red Rock Canyon, the Welcome to Las Vegas sign, and the Mount Charleston Lodge. The next day we went to the Las Vegas Motor Speedway, where we had a chance to push the Siennas to their limits. After we drove the Siennas, the owner of the track (who was a former Formula 1 winner) and another race car driver took over, and showed us how fast these cars could really go. Now, driving the Siennas on the racetrack was an amazing experience, where we could all witness the sporty nature of the minivans. 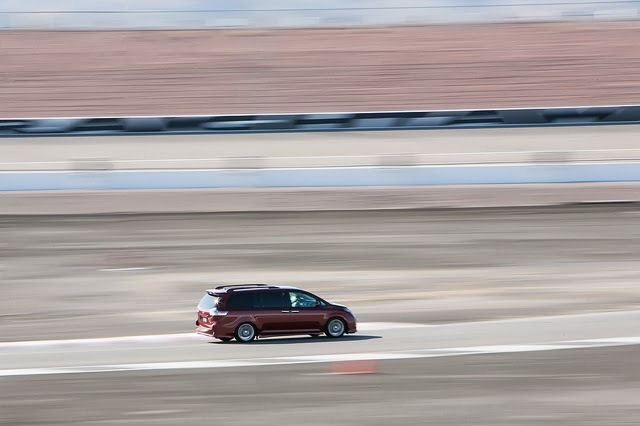 Everyone knows minivans have plenty of cup holders, but few people can imagine them speeding down a racetrack. And then we drove a Ferrari. I'm not good enough of a writer to even try to describe what it's like to drive a race car at 180mph. When I was done, I thought of it as a once-in-a-lifetime experience, but a couple of weeks have passed, and I feel like this is something I'm going to have to do again. Besides, I look damn good in a racetrack suit. Then we had a poker tournament, where I won $30,000. Fake money. So what else? 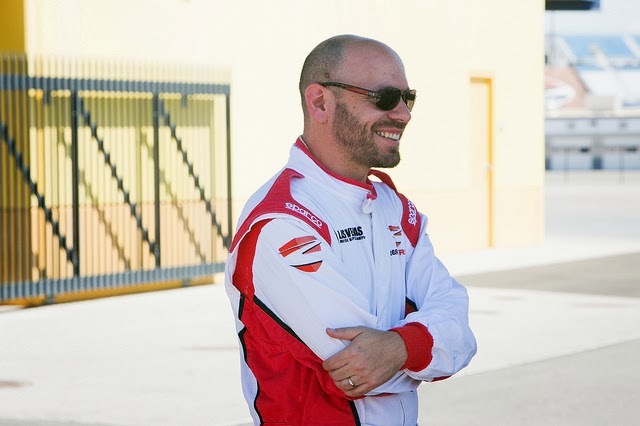 Beyond the incredible experience provided for a few lucky guys by the Toyota people, and beyond the unquestionable fact that I look dreamy in a racetrack suit, what did I learn? I wish no one were affected by perception. I wish we could all judge items by actual value rather than by the way items potentially reflected on our attempts to create our identities. I hope everyone reaches that point, eventually. Me included. Thanks for hanging out with me, Aaron from Daddy Files, John from Daddy's in Charge?, Fred from Mocha Dad, Jeff from Out with the Kids, Colby from Days of a Domestic Dad, Dan from DanZevin.com, Pete from dadand, Troy from Dadventurous, Chris from AskMen, Scott from Gear Patrol, and Shawn Parkin, who is the photographer responsible for all the great pictures on this post. And a huge thanks to the people at Toyota and to the people at Golin Harris! The At-Home Dad Network is one of the most important organisations I've come across. When I became a stay-at-home-dad (well, there's no ceremony involved. I simply quit my job), I thought I was the only one there--the only man in a world of stay-at-home-moms. Quickly, self-doubts popped up: There must have been something wrong with me--why else would I fail to find a real job? I thought about that while holding the baby I loved, unable to see the reality of my situation. I wouldn't say I was brought up in an environment of strict division of labor. Both of my parents worked, and although my mom was the default cook/cleaner in the house, my dad did his share. And still, I wasn't prepared to be the first one to stay home with the kid and switch centuries-old norms. I still felt that salary defined men. And even if I could overcome that, the loneliness, and the weight of feeling like a pioneer in this unknown territory was debilitating. And that's why the At-Home Dad Network is so important. Beyond the advocacy they do, and the annual convention that brings many of us together, simply the page on the site, listing all the local groups of stay-at-home-dads is a life-saver. It tells us we're not alone--there are many like us: men who didn't expect to be stay-at-home-dads, but do it now, because it's what they need to do, and that for me is the absolute definition of strength. A weak person, I've come to realize, would have stayed at his job because of fear, but by staying home to raise my kids, allowing my wife the opportunity to concentrate fully on her career, I was being a freakin' superhero. Hey, at least in my head. This year, the convention is in Denver. There's a very good chance I'll be there, because it's important. And because it's fun. And because when else am I going to be in Denver? Click on the picture below to go to the site, where you'll be able to see me in the header image, my face completely hidden behind text. Hey, I understand. See you in Denver, hopefully! A new law went into effect in Maryland last month, meant to improve fire safety in the state. 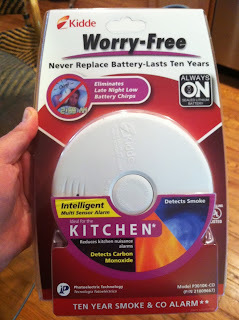 Since most smoke alarms are equipped with batteries that need to be changed every 6 months, and since it is often the case that people remove these batteries to prevent them from making beeping sounds in the middle of the night when the batteries are about to expire, most people have smoke alarms that don't work as well as they should. The new Maryland law will take care of that problem by requiring homeowners to replace any battery-operated smoke alarm more than 10 years old with a unit powered by a 10-year sealed-in battery. Sure, the conspiracy crowd sees this as the final proof of Big-Brother invasion. But while technology has improved in so many different fields, old-fashioned smoke alarms are still around, acting more as a nuisance than as an essential safety tool. And since there have been more fire-related fatalities in Maryland than last year, I think the government is right in acting here with this new law. The Maryland State Fire Marshal's Office and other fire officials have joined leading fire safety product manufacturer, Kidde Fire Safety, in a public service campaign urging families to take action. I hope I can convince you to head into your local Home Depot and get a Kidde Worry-Free Smoke Alarm, whether you live in Maryland or not. I received a review sample in the mail, for the record. The good news is that you can get one too, if you live in Maryland. 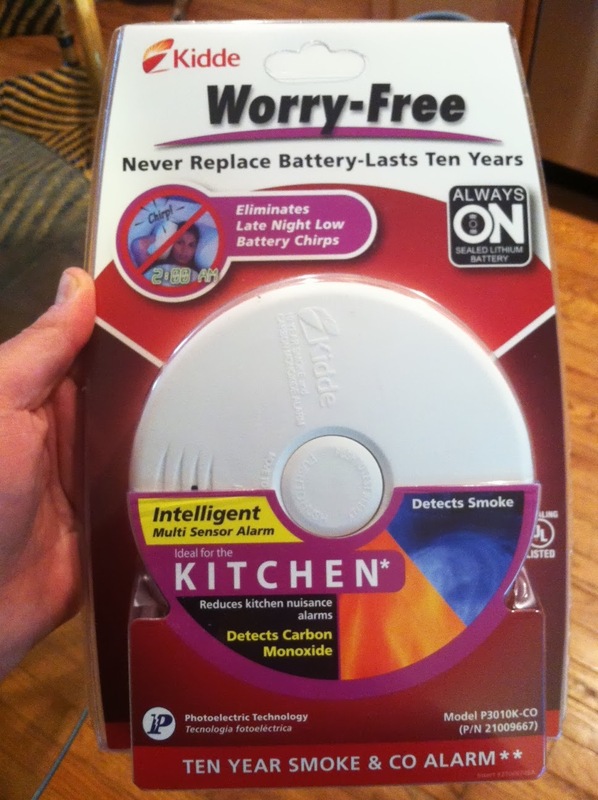 Kidde is giving one free 10-year smoke detector to a Maryland reader of this blog. I'll make the sweepstakes as easy as possible, since it's limited to Maryland residents: just tweet about the giveaway. The social landscape is changing, and no one knows what to do with it. Things used to be simple in the past: Men worked all day, while women stayed home to raise kids. There was nothing natural about this arrangement, but since it was pretty much the norm, people got used to it, to the point where they thought it was natural for all men to work outside the home and to barely see their kids, and for all women to consider their ultimate goal to be raising kids. Then things changed, and now no one knows what to do with the changes. Well, we know what to do with some of it: most Americans no longer accept the idea that women can only be happy at home. Staying home with the kids is no longer "natural," but is considered a choice. Some women "lean in" or "opt out," or whatever the buzz word of the day is for the decision to stay home to raise kids, and some women work outside the home. The same is still not true for the other part of the equation. For many in the US and elsewhere, masculinity and work outside the home still feel like they're naturally connected, while the decision by men to stay home and raise kids is still considered unnatural, or emasculating. The media has some hit and misses with portrayal of parental roles. Unfortunately, some shows take the easy path and portray stereotypes as natural, instead of questioning these stereotypes. "Modern Dads," a new reality show on A&E, will try to break apart the stereotypes and show men who stay home with their kids as real people, who may have many problems, but feeling like they're doing something unnatural isn't one. At least that's what we can hope the show will do. Reality shows can sometimes focus on the scandalous rather than on the mundane, which is fair enough, but in this case, probably the best advertisement for stay-at-home-dads would be if their lives were shown as not very dramatic. What I'm trying to say is that I hope this new show portrays stay-at-home-dads in a positive way and has little negative drama, but if something does happen, I hope the people behind the show treat the participants and the subject delicately and with respect. 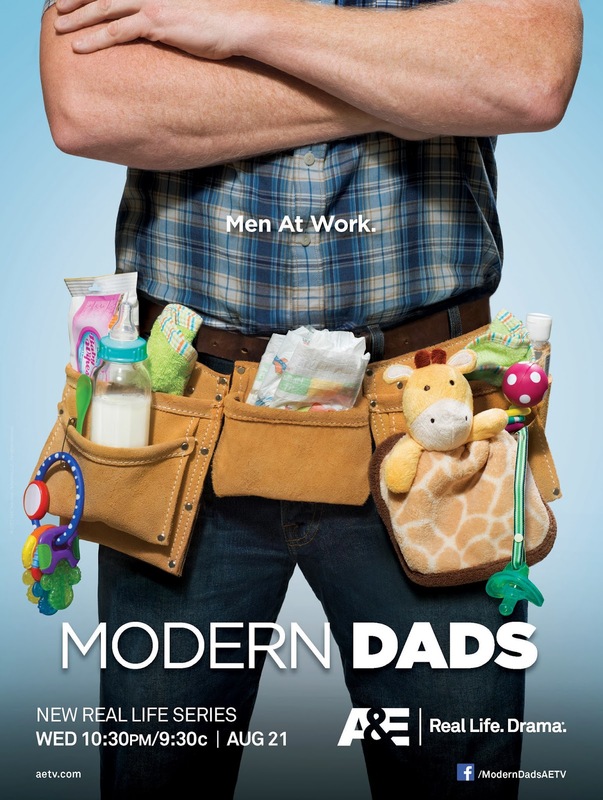 I'm optimistic, since I know one of the people working on the show (Adrian from the Dad or Alive blog), and I hope the show succeeds in showing that staying home to raise kids is as natural for men as going out to work outside the home. If you want to read more about the show, including Q&As with the cast, videos, and more, click here for the show's website. $25 gift card to Toys R' Us! I'll put a Rafflecopter below for a week. Good luck! One more thing. A&E is hosting another, bigger giveaway on their Facebook page. I've copied and pasted the details below. Good luck! Submissions and voting will take place until September 6, 2013 at 12:00pm. On September 6, 2013, the top ten Dadgets with the most votes will be posted. Voting for the top ten will conclude on September 23, 2013. The winner with the most votes will be announced September 24, 2013. 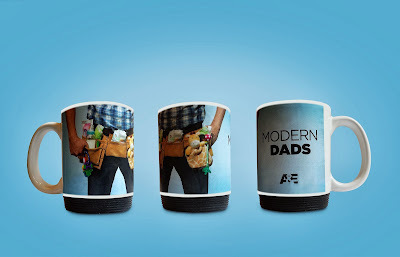 The Life of Dad people have been doing a lot of really cool things lately, partnering with big brands to create cool campaigns and contests. Today, I'm joining them with an Instagram video entry to their Starbucks VIA promotion. 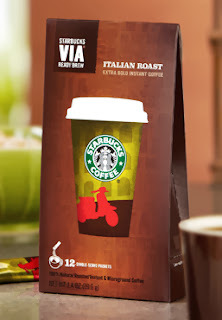 Starbucks VIA are individual packets of instant coffee, so next time you go to a house that doesn't have coffee ready for guests (because they hate America and freedom? ), all you'll need is boiling water and a small packet of VIA. Now, I've received some free VIA packets for the review: a box of Colombia and a box of Italian Roasts. I'm looking at the list of VIA flavors on the Starbucks site, and there are a lot of other boxes I plan to try, like the Caramel one. And maybe iced coffee blends. And if my video doesn't do it for you, look at the other VIA videos on the Life of Dad site, or even better, create one yourself! One of the VIA videos will win a Starbucks card valued at $500, while the second and third place will settle for $200 and $100 cards. You have all the rules on the Life of Dad page, and hopefully you can make a video that will be EVEN better than my own, as if that's possible. 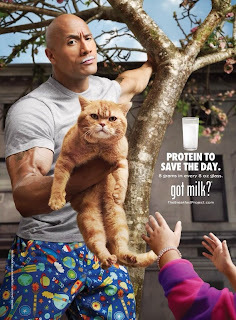 Thanks to the good people at the Life of Dad site, I am now an official entrant in the #SuperMilkMan contest. Based on my video submission below, I may (or may not) win a trip to meet The Rock, and I assume, arm-wrestle him. You can see my daughter was born to act, and Doggie also does a pretty good job. I've never tried doing an Instagram video before, but these things are fun. Look out, Peter Jackson. I have an Instagram, and I'm not afraid to use it! The Life of Dad guys are also hosting a Twitter party on 8/15 at 12pm EST, which will be co-hosted by Chris from Daddy Doctrines, Vincent from CuteMonster, and Eric from DiaryDad--all great blogs you should check out, by the way. 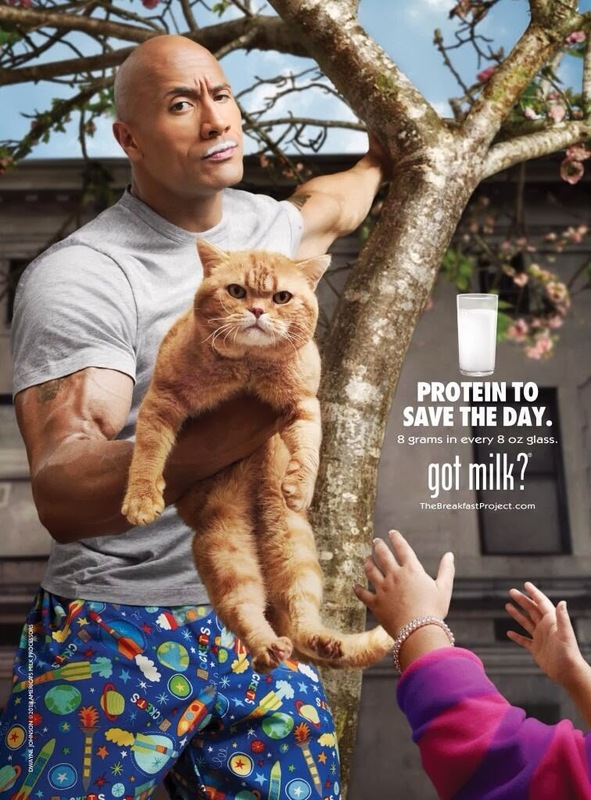 During the Twitter party, 5 people will win "The Rock – Milk Prize Packs," valued at $98 per basket. 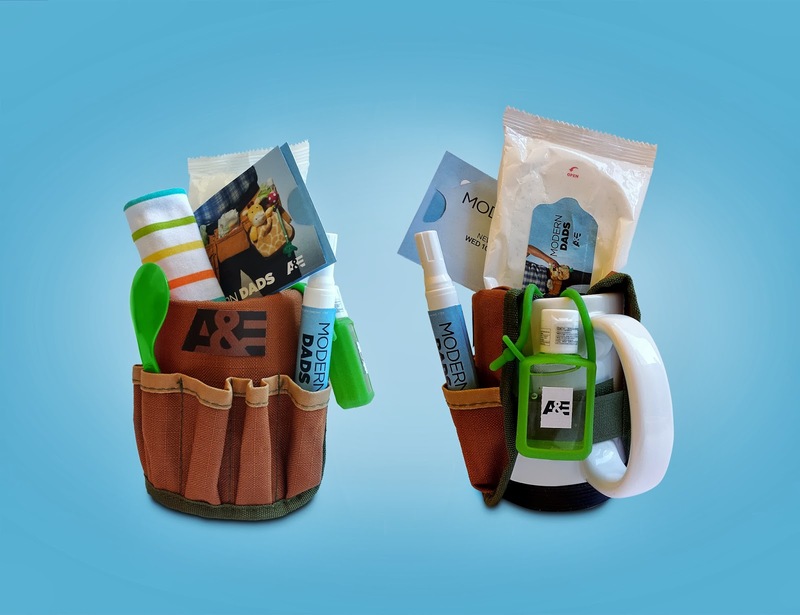 There are special SuperMilkMan spoons, and masks, and clothes, and milk glasses and all sort of fun things to win, and you'll have to tune in to the Twitter party for more information. Just follow the #SuperMilkMan hashtag on 8/15 to join! Now... Here's my entry, followed by the one The Rock did for the Superbowl. To be fair, his budget was bigger, and our lion tamer bailed at the last minute. I was compensated by Life of Dad, LLC for this post. Doesn't make it less cute, though. I met Dustin a few weeks ago. He's doing his masters at the University of Baltimore, so I met up with him one day to talk about the secret world of blogging for fun and profit. We sat in a small restaurant, surrounded by cold Yuenglings and hot ladies pizza, and talked about writing, and about our plans, and about parenting in general. 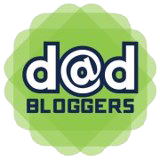 It's great to meet new people through the Dad Bloggers group. I really feel like I've made nearly 400 friends in the last few months. But it's good every once in a while to meet a real person, and talk over beers about blogging, about parenting, and mostly about the way we take ourselves too seriously when it comes to both. Dustin Fisher is an amateur standup comedian, storyteller, freelance writer, and stay-at-home dad, all of which are just better ways of saying “unemployed.” He has worked in the area of collegiate recreation for the previous 14 years and ran a day camp for nine of them, during which he got the reputation as being “good with kids,” which basically means he has no regard for his self image and makes a good target for ridicule. He is hoping to translate this lack of self-respect into a postive parenting style. And it's funny to me, because people have always told me I'd be a great dad because I liked playing with kids, and I also never believed them, because hanging with kids is not the same as taking care of them and raising them. Turns out I'm not too bad, so my guess is that Dustin isn't half bad as well. 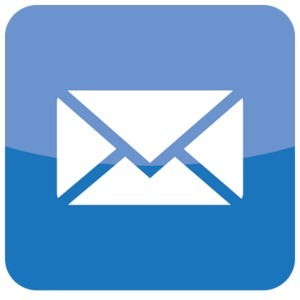 Dustin's blog, Daddy Needs a Nap, is a great testimony to modern life for parents. We try, we struggle, and we do fine as long as we make some jokes along the way. Dustin has moved away from stand up, and more into a little bit more serious spoken word. It's a thin line, I guess, because his recent video is still funny. It's serious and maybe less exaggerated than standup comedy, but it's still funny. Funny in a I-Think-We-All-Need-A-Hug-Now way, but still funny.